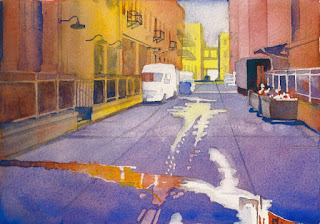 I passed this alley while strolling along the 16th Street Mall in Denver, Colorado's Lower Downtown (LoDo) area. I was drawn to the manner in which the puddles of water in the alley contrasted in shape with the buildings--the water creates its own flowing, organic shapes, whereas the man-made elements such as buildings, vehicles, etc. are boxy and rectangular. I also liked the warmth to this image. I painted this in sort of a split-complementary fashion (I say "sort of" since I strayed a little beyond the strict three-color requirements of a split complementary, but I stayed pretty close). My results are a little more low-key than I had intended, but I'm satisfied overall with it. This painting is a sketch for a larger work I intend to paint of this same scene.